Premium Sipping Vodka is the best ranked non-flavored vodka made in Texas. sweetener here! This ultra-smooth vodka features a hint of pure grapefruit and mango for a guilt-free refreshing zing. What do you get when you take a passionate, world-class winemaker and turn him loose in a distillery? You get unbelievably sublime spirits—and an amazing palette for the unexpected. You get a commitment to hand-made, small-batch art in a bottle. You get DuckworthVodka. Lee Fuqua, a native of Dallas, began his career with Fuqua Winery. After repeatedly garnering the industry's top honors, including the coveted Double Gold Medal at San Francisco International Wine Competition among many others, he decided to turn his culinary, viticulture and enology studies toward spirits. Duckworth Distillery was born. Duckworth is named after Lee’s grandfather, H. E. Duckworth, a pioneer in the Texas fruit juice business. "Duck", as he was known, loved a good highball and so instilled in Lee a commitment to develop the finest spirits—ones that would make his Papa proud. After traveling the world and sampling a vast array of flavors and techniques, Lee and his wife Julia returned to Dallas to begin the quest. Immediately, Lee's experiments in innovative distilling and spirit production were rewarded. 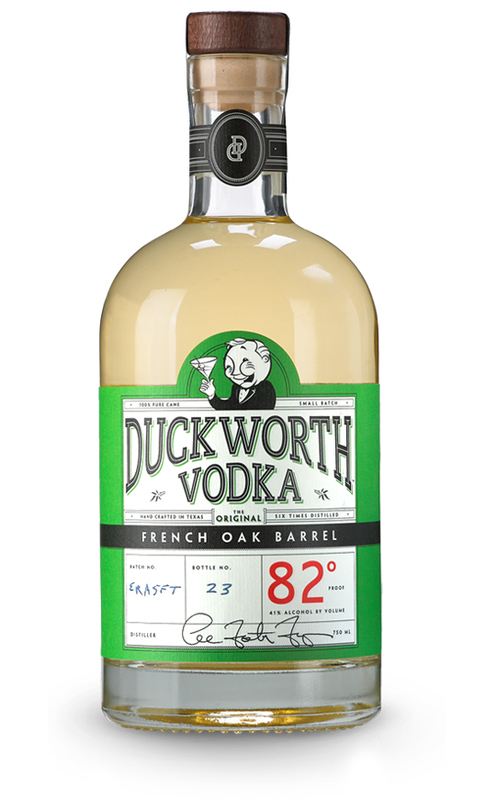 The first small batch of Duckworth Vodka medalled in national competition, prior to release. The spark was ignited and a thirst for unmatched spirits was born. Today, Lee continues to pursue fresh ideas, the highest possible quality ingredients and the purest, most refined process for distilling spirits—all with an unbridled enthusiasm that prompted our decision to put his likeness on our label. His passion is contagious—and it's paying off. Multiple awards and a growing following of loyal devotees continue to join the Duckworth family and to fuel our quest to make the finest, smoothest, hand-made vodka we can make. Welcome to Duckworth Distillery. For a full list of where to buy, click here.